Who can resist the allure of a box of buttons? Not me. Even though deadlines were stacked on top of deadlines, I grouped my piles by color, admiring the matte and shiny finishes, the shapes, the shanks and the two-hole versions. 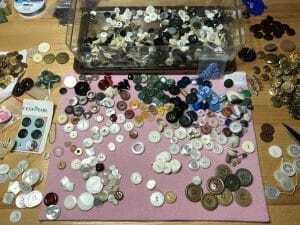 Buttons of all shapes, sizes, and colors spilled off the bead mat, hung around my workbench and generally distracted me until I had ordered a portion the chaos. Suddenly categorizing stopped. An idea demanded to be seen, a bead crochet necklace with buttons and charms. I picked up my crochet hook, my natural-color spool of waxed lined and went to work. 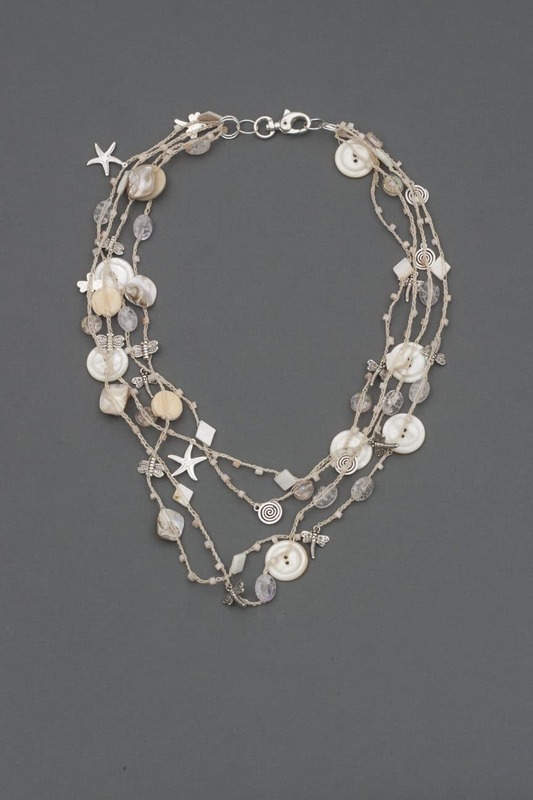 In a matter of minutes, I’d strung an assortment of shell beads, mother-of-pearl buttons and silver charms on my thread. Without hesitation I chained a long, strand that soon became a lightweight statement necklace. My buttons – or, at least some of them – now had a home. Thanks to a box of buttons, I hit the inspiration jackpot. Unable to contain myself, I changed colors and started over. That’s exactly how quickly you’ll create “Whimsical Strands. Want to play with my buttons? You’ll have a choice of kits in this workshop. 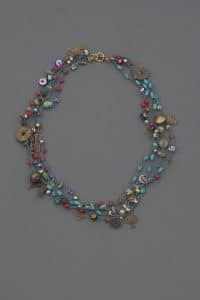 Each participant will embellish their bead crochet necklace with buttons and charms. Plan your schedule so you can play! For eight days you can indulge your art experience with dozens and dozens of Art Unraveled workshops, from July 31, 2018 through August 7, 2018. Registration is now open.